1 C/o Pucca Sr. Sec. 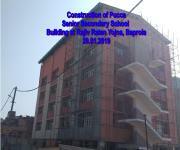 School Building at Rajiv Ratan Yojna, Baprola, Delhi (SH : Civil and Electrical). - C/o Pucca Sr. Sec. School Building at Rajiv Ratan Yojna, Baprola, Delhi (SH : Civil and Electrical). Agreement No . : 01/EE/Edu(M)West/2017-18 13.29 Cr.